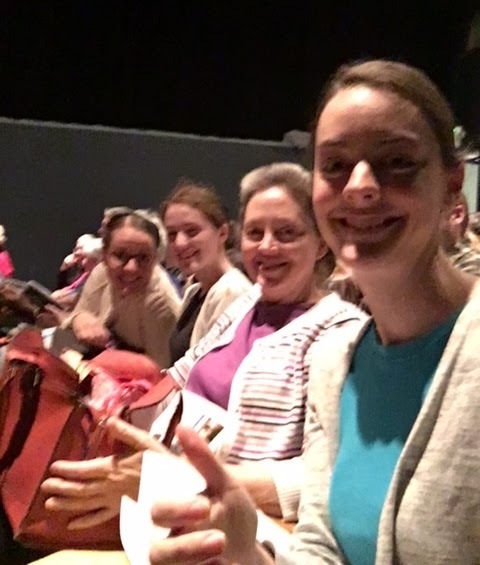 The Smucker ladies have taken up the annual April Blogging Challenge. I will be posting on Mondays and Thursdays. Emily will post on Wednesdays and Sundays at The Girl in the Red Rubber Boots. Jenny will post at Here Shall the Wild-Bird Sing on Tuesdays and Fridays. And Amy will dust off her blog and join us on Saturdays, here at Random Thoughts and Dancing Words. After that series of posts on poverty and wealth, I thought you might like to see a Mennonite fundraiser in action. Gospel Echoes Northwest is a prison ministry that hosts singing/preaching programs at prisons all over the Northwest. 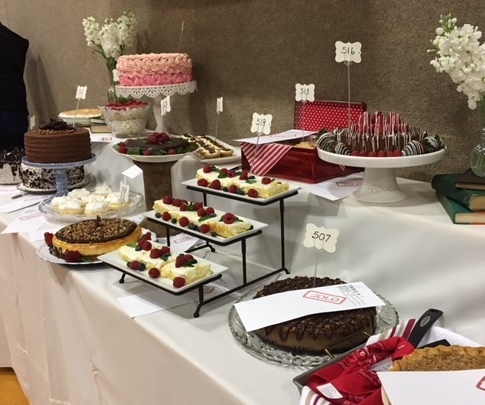 In addition, they organize an annual Christmas cookie project, where volunteers hand-deliver cookies and cards to thousands of inmates, and a Freedom Rally, where volunteers barbecue hamburgers and provide an amazing home-cooked meal to inmates at an outdoor rally. They provide free Bible lessons and I'm sure there's more that I can't think of right now. One family plus a fluctuating number of singers and sometimes a nanny work with the ministry full-time, and there are many volunteers. 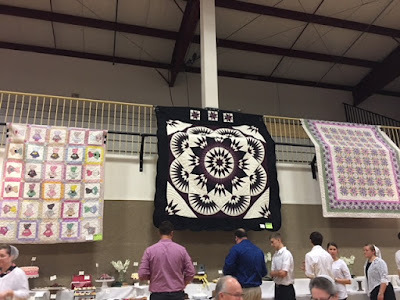 The ministry is funded through the Gospel Echoes Northwest Auction, which is held once a year at Fairview Mennonite's Multipurpose Building. It involves much more than just auctioning off some donated items. We attended the most recent auction, on March 24. 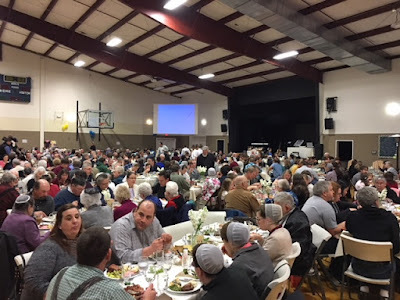 First of all, tickets for one table, representing ten people, sold for $500, and there were over 40 tables, with some people turned away. Every variety of Anabaptist in Oregon was represented--German Baptist, Independent, Western Fellowship, and sort-of-BMA. Brownsville and Halsey and house churches and Riverside and Fairview and Sheridan and Winston and more. We were all happy to come together for the same cause. We don't always cooperate this well, so the auction reminds us that our similarities are bigger than our differences. The cooks made a wonderful meal. Paul had "bought" one table, which we filled with a few from our family plus friends and Paul's mom and Aunt Susie. A children's Read-a-thon collected $56,000 in the weeks preceding the auction. The child who raised the most money received a bicycle. Probably 75 people brought homemade desserts that sold for up to $150 each. 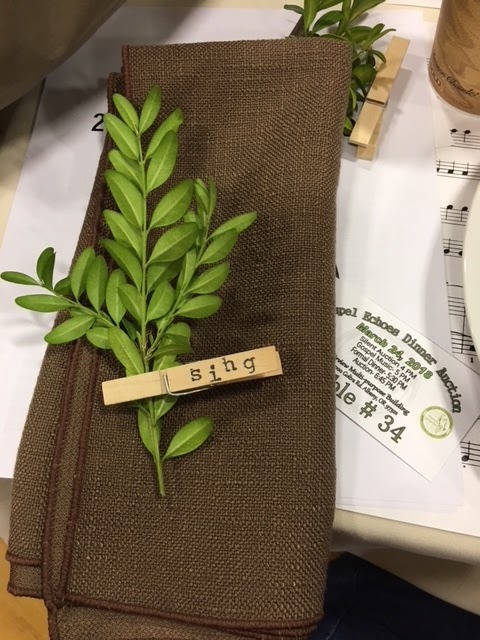 The silent auction featured a certificate for strawberries from Horse Creek Farms, hanging baskets of pansies [which I got, 6 of them], gardening supplies, baby quilts, purses, cleaning supplies, toys, and a lot more. Servers in black and white. 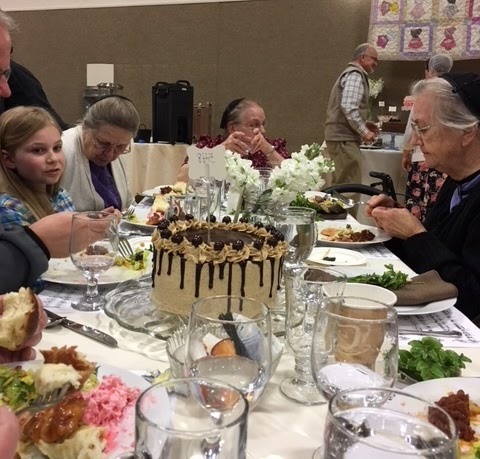 The meal was truly a feast, and a large team of young people served water and coffee. This is a place to see and be seen, and to meet Mennonite young people you wouldn't otherwise get to know. It's always a very big deal who you get to serve with, and if you're a girl, you act like you want to serve with your brother, but you really hope Rita Baker the organizer pairs you up with that guy from Riverside. Way back in about 2003, Matt was serving with a girl from Fairview Mennonite, and Kevin Kauffman said he'd pay Matt $100 if he asked her out, and Matt was planning to, but then she left before Matt got up his courage. So we'll never know what Might Have Been. They also wore black and white, back then. So you see, some things never change. These two friends were happy to serve together. Dale Ropp, a guest at our table, bought a coffee-chocolate cake and shared with the rest of us. I left after the meal but before the auction really got underway. Paul reported that everything sold well. "The economy is good, and people are doing well," was his assessment. A trip for ten to the Cowboy Dinner Tree (a famous restaurant in the wilds of eastern Oregon), spraying for one field, a hickory rocker, a tea party by the Baker ladies, three quilts, a truckload of gravel--the donated and auctioned items filled two pages. The evening raised $132,000 in addition to the read-a-thon. Paul also said, "If I were still poor, I don't think I'd want to attend the auction." I agreed. 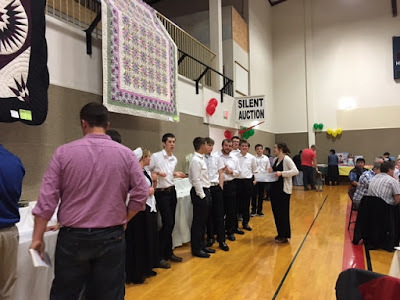 Even with the means to give, the pressure of the auctioneering makes me nervous, which is why I left early. It's interesting, though, to talk to the auctioneers in private about how this event differs from other fundraisers. At other events, they say, there is always the rich lady near the front who wants recognition for how much she gave. Mennonites subtly nod or flick the cards with their auction number to confirm a bid, and don't like to be singled out as being big donors. But we note that they still are bidding at a public auction rather than writing an anonymous check in private. 1. There are lots of unwritten rules. 2. The food is amazing. 3. A lot gets done without a lot of noise or cost. 4. Pretty much any skills are welcome, and the more hands-on the better. Yes, I always anticipate April too! Wow, thanks for the tour! I have just in the last few months been introduced to your blog, and I LOVE it! I am a fellow blogger and homeschooling mom at http://prairielucasfamily.blogspot.com. This evening while my older children are filling tax forms, I am restless, and sat down to check out your blog again. I enjoy your thoughts and candid observations so much. 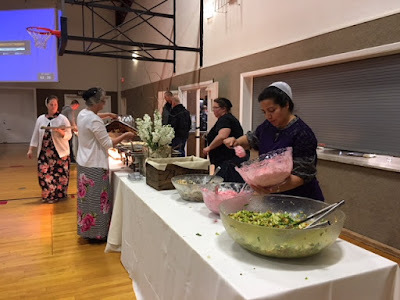 I have had many Mennonite friends through the years, and my husband and I have been involved in missions and a bit of prison ministry as well. Plus we live out west, too! So I relate! For me, auctions are a little painful because there just isn't money to Spend on Things. And, like you, I can't help but wonder why we don't all write out that anonymous check and save everyone all the work! But getting together and eating and talking and having a good time is important, too.